The origins of the Art Stock Exchange go back to the year of 1863 when the very first producer Art Fair, better known as the Salon des Refusés, took place with the aim to sell art outside the usual Gallery space. Out of this very Art Fair with the aim to bundle art works and trades of art works, the founders established the Art Stock Exchange. 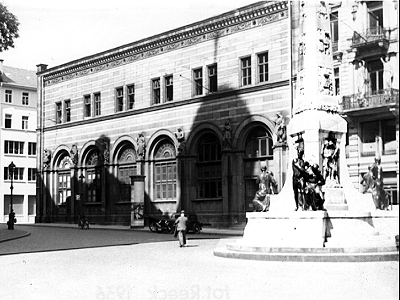 In 1874 they moved into the former building of the Frankfurter Stock Exchange at the Paulsplatz when they on their part moved to the new building at Börsenplatz. Currently, Approximately 80% of the market participants of the Art Stock Exchange come from abroad. As of November, companies from more than 80 countries list on the Art Stock Exchange with 29% from North and South America, 27% from Europe (including Russia), 41% from Asia and 3% from Australia and Africa. The trading index at the Art Stock Exchange is WAX, the world art index. It is world wide effective.